New research led by researchers from Georgia Institute of Technology, Dublin City University, Michigan State University, the University of California at San Diego, the San Diego Supercomputer Center and IBM, provides a new and extremely promising avenue for solving this cosmic riddle. The team showed that when galaxies assemble extremely rapidly—and sometimes violently—that can lead to the formation of very massive black holes. In these rare galaxies, normal star formation is disrupted and black hole formation takes over. The key criteria for determining where massive black holes formed during the universe's infancy relates to the rapid growth of pre-galactic gas clouds that are the forerunners of all present-day galaxies, meaning that most supermassive black holes have a common origin forming in this newly discovered scenario, said John Wise, an associate professor in the Center for Relativistic Astrophysics at Georgia Tech and the paper's corresponding author. Dark matter collapses into halos that are the gravitational glue for all galaxies. Early rapid growth of these halos prevented the formation of stars that would have competed with black holes for gaseous matter flowing into the area. "In this study, we have uncovered a totally new mechanism that sparks the formation of massive black holes in particular dark matter halos," Wise said. "Instead of just considering radiation, we need to look at how quickly the halos grow. We don't need that much physics to understand it—just how the dark matter is distributed and how gravity will affect that. Forming a massive black hole requires being in a rare region with an intense convergence of matter." "Previous theories suggested this should only happen when the sites were exposed to high levels of star-formation killing radiation," he said. "As we delved deeper, we saw that these sites were undergoing a period of extremely rapid growth. That was the key. The violent and turbulent nature of the rapid assembly, the violent crashing together of the galaxy's foundations during the galaxy's birth prevented normal star formation and led to perfect conditions for black hole formation instead. This research shifts the previous paradigm and opens up a whole new area of research." The earlier theory relied on intense ultraviolet radiation from a nearby galaxy to inhibit the formation of stars in the black hole-forming halo, said Michael Norman, director of the San Diego Supercomputer Center at UC San Diego and one of the work's authors. "While UV radiation is still a factor, our work has shown that it is not the dominant factor, at least in our simulations," he explained. 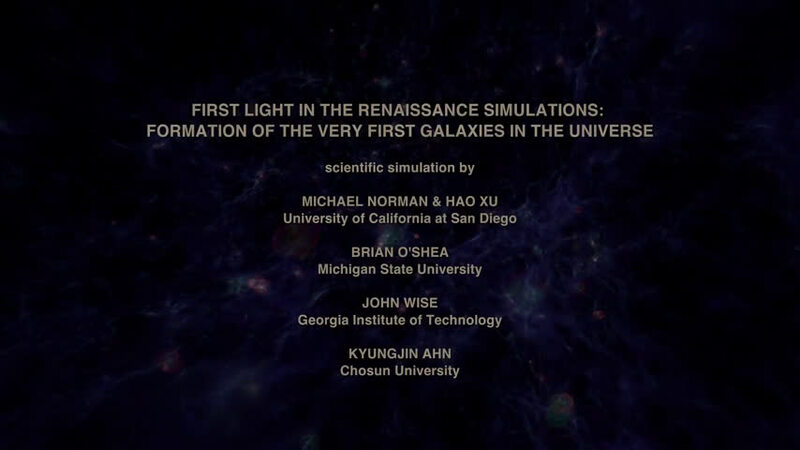 The research was based on the Renaissance Simulation suite, a 70-terabyte data set created on the Blue Waters supercomputer between 2011 and 2014 to help scientists understand how the universe evolved during its early years. To learn more about specific regions where massive black holes were likely to develop, the researchers examined the simulation data and found ten specific dark matter halos that should have formed stars given their masses but only contained a dense gas cloud. Using the Stampede2 supercomputer, they then re-simulated two of those halos—each about 2,400 light-years across—at much higher resolution to understand details of what was happening in them 270 million years after the Big Bang. "It was only in these overly-dense regions of the universe that we saw these black holes forming," Wise said. "The dark matter creates most of the gravity, and then the gas falls into that gravitational potential, where it can form stars or a massive black hole." 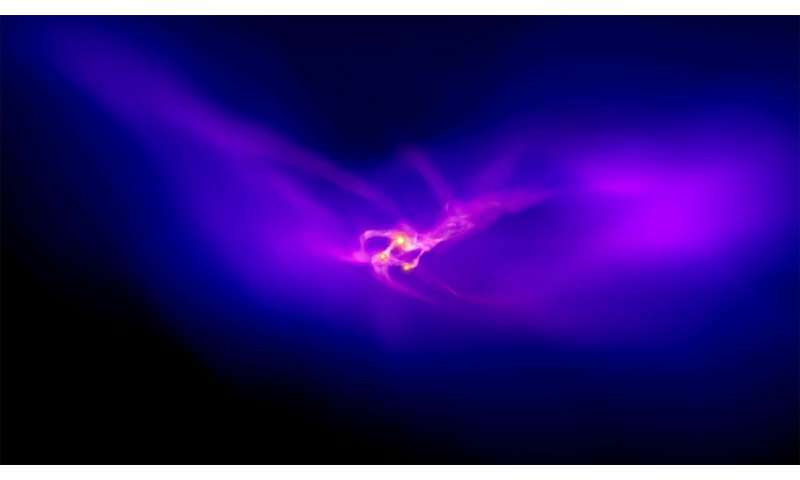 The Renaissance Simulations are the most comprehensive simulations of the earliest stages of the gravitational assembly of the pristine gas composed of hydrogen and helium and cold dark matter leading to the formation of the first stars and galaxies. 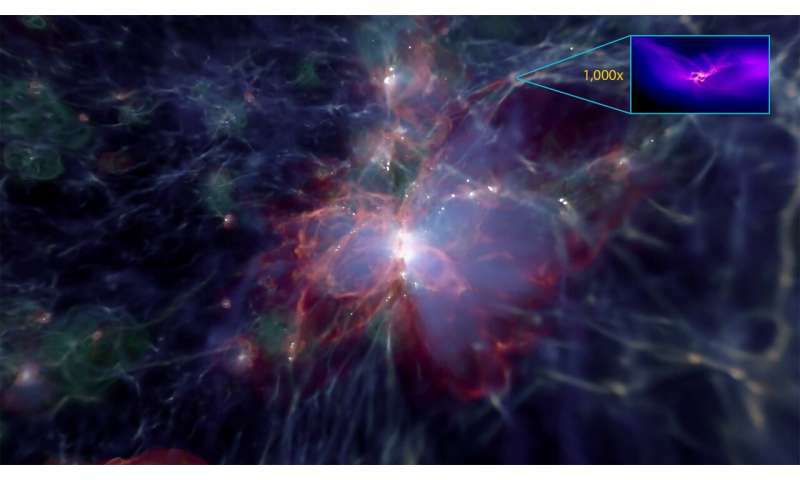 They use a technique known as adaptive mesh refinement to zoom in on dense clumps forming stars or black holes. In addition, they cover a large enough region of the early universe to form thousands of objects—a requirement if one is interested in rare objects, as is the case here. "The high resolution, rich physics and large sample of collapsing halos were all needed to achieve this result," said Norman. "Astronomers observe supermassive black holes that have grown to a billion solar masses in 800 million years," Wise said. "Doing that required an intense convergence of mass in that region. You would expect that in regions where galaxies were forming at very early times." "An exciting component of this work is the discovery that these types of halos, though rare, may be common enough," said Brian O'Shea, a professor at Michigan State University. "We predict that this scenario would happen enough to be the origin of the most massive black holes that are observed, both early in the universe and in galaxies at the present day." Future work with these simulations will look at the lifecycle of these massive black hole formation galaxies, studying the formation, growth and evolution of the first massive black holes across time. "Our next goal is to probe the further evolution of these exotic objects. Where are these black holes today? Can we detect evidence of them in the local universe or with gravitational waves?" Regan asked. "The Renaissance Simulations are sufficiently rich that other discoveries can be made using data already computed," said Norman. "For this reason we have created a public archive at SDSC containing called the Renaissance Simulations Laboratory where others can pursue questions of their own." Simulations based on math fairy physics! These are committed merger maniacs defending their Relativistic turf. well tux, if you were a doer? After all if any of those bodies of science fail? Then they all fail! But then, without a working computer or other working communication device based on those failed sciences? How would you ever let the rest of the know of your genius? "When you can measure what you are speaking about and express it in numbers you know something about it, but when you cannot measure it, when you cannot express it in numbers, your knowledge is of a meager and unsatisfactory kind..."
Tuxford! Can you at least do the math to figure out how many years you're behind in your meager and unsatisfactory understanding of the world? "This [mathematical] research shifts the previous paradigm and opens up a whole new area of research." "When you can measure what you are speaking about and express it in numbers you know something about it, but when you cannot measure it, when you cannot express it in numbers, your knowledge is of a meager and unsatisfactory kind... but you can still be the leader of the free world..."
This is pretty important. The ultraviolet disruption theory has many problems; this theory seems to have less. This will have multiple impacts upon the theory of galaxy formation, I think. The effect that simulated black holes have on simulated universes is simulationally amazing. These reported simulated effects should lead to some new simulations which reveal even more simulated physics in the simulation. Simulated physics is burgeoning field. If the same people doing these simulations manage to simulate a verifiable reality accurately, all physics can then be reduced to simulations...as it is whenever any physics regarding black holes or dark matter is stated as "discovered" by the simulators. Hey Granville, can I get a simulated poem? "The light released from around the first massive black holes in the universe is so intense that it is able to reach telescopes across the entire expanse of the universe." Why do they call them black holes (where the light can not escape)? Why do not they call them luminous bodies? The effect that simulated... simulated... simulationally... simulated... simulations... simulated physics... simulation. Simulated... simulations... simulate a verifiable reality accurately,... simulations... simulators. theredpill! How are you? Well, I hope. Granville can be entertaining, but I for one find your prose to be much more inventive and intelligent--even the snark above. Sorry for the hatchet editing of your comment, but I needed to make room to display my own mental simulations. That is your actual objection isn't it?---not that physicists simulate reality, but when simulations are mistaken for it? We're all just doing our best in that regard. Dsylvan - Very well thank you for asking. Again. thank you for the thoughtful response. "That is your actual objection isn't it?---not that physicists simulate reality, but when simulations are mistaken for it? " Let's say you want to program a simulation to test the effect of more powerful jet engines replacing existing ones on any jet...the simulated results will be accurate because all of the other variables are known. Think about how many variables in the above are guesses, inferred based on other calculations that are also based on inferred values. The simulation's output has a very narrow possibility of variance...in other words it can only show what the programmed variables allow it to. Variables with set values that cannot be confirmed. The above (like all calculations that "create" BH's) is based on Schwartzschilds math. The simulation will always produce a BH once you put enough mass in the space. And yes, also when they are treated as real. I could have said the above simpler....sorry. If you are trying to learn something about reality from a simulation, the only unknown variable can be the one you are trying to find. These simulations carry a "IF EVERYTHING we have guessed at is correct, this is what happens" disclaimer attached to them that most people who like the result will choose to ignore. "....light from the most distant black holes (or quasars) has been traveling to us for more than 13 billion light years." I expect someone writing for a scientific journal to know the difference between time and distance. "A black hole is a region of spacetime exhibiting such strong gravitational effects that nothing—not even particles and electromagnetic radiation such as light—can escape from inside it." (or 30,000 x 40,000 ly http://www.astrod...y.html). How does the light (radiation) penetrate through a layer of matter of thickness of 1.500 to 20.000 ly? poksnee--- I'd expect someone writing for a science journal to know that they're equivalent at cosmological scale. .....These simulations carry a "IF EVERYTHING we have guessed at is correct, this is what happens" disclaimer attached to them that most people who like the result will choose to ignore. Respectfully theredpill, the disclaimer as you've so nicely stated is assumed as always given. I don't think anyone who doesn't understand this would be able to write a successful thesis let alone be given a position in any institution that would carry out this level of research. The phrasing was correct. But just for giggles--how would you phrase it? In what units do you measure the distance to quasars---while you claim that others are ignorant? @pok, it was written by the University of Georgia. You can look right up there next to the title and the source is named. As for the use of "for," it would be correct to say "I've been driving for five hundred miles." How is this different? "CMB (according to Big Bang theory), the photons started traveling freely into space, which is not our Universe. It is an area outside the whole, from which the radiation starts and inside which stars and galaxies (our Milky Way included, too) were created. The radiance (CMB) is even in all directions and, according to Big Bang theory, it should mean that CMB and other radiations return back into the whole, from which they started 13,7 billion of years ago, because the radiance (CMB) is almost even in all directions and they don't originate from a single point, which should represent a starting whole, from which photons (CMB and other radiations) started. Link? Journal reference? Best not be the notorious IEEE Journal. The unit year is time....the unit light year is distance. Since the speed of light is constant the phrase should read ...light from the most distant black holes (or quasars) has been traveling to us for more than 13 billion years. Ummmm, yeah, right. Shoulda figured you were a nut. My bad. Why do they call them black holes (where the light can not escape)? If you open Wikipedia (https://en.wikipe...HD_93250 or http://ned.ipac.c...objname; http://simbad.u-s...023435.9 http://hubblesite...583/news ) is used everywhere length (distace). You do not have to prove the obvious. Who does not want the evidence can not reassure them. Okay poksnee, I see that you are thinking about it. But the year is only a time unit in our local frame of reference. In the cosmological frame, what the article talks about, time and distance can't be separated---and the light year is the standard unit for measuring space/time. So "...has been traveling to us for more than 13 billion light years" is correct. ...Who does not want the evidence can not reassure them. wduckss---That's quite good! Slightly better: "Who does not want the evidence, the evidence can not reassure them." And why do you apply this to others and not yourself? ??? Your stories and jokes as opposed to my evidence. Your evidence? What I'm trying to get across to you and others is that evidence isn't actually evidence until it's proven to apply to everyone. You, me, poksnee, a Nobel Prize winner, nobody gets to decide ALL BY THEMSELVES what constitutes evidence. This is why science was invented--so we don't have to figure it out alone--and we're ALL awaiting the results. Yes, in the meantime you can decide for yourself what you take as evidence, but just for you--not for me or anyone else. What's worth to give you proof. You're still telling the story. And the blind man sees it. Only does not see blinded and wich are doing propaganda. I've been pointing to sources for evidence (5 hours ago). The evidence is official, the institutions are renominated (top). You do not offer evidence, but you decide which evidence is good and which is bad. How does the light (radiation) penetrate through a layer of matter of thickness of 1.500 to 20.000 ly? Do not forget the gaseous planets in our system. They have to come up with a simulation that makes black holes possible less than a billion years after the theorized Big Bang. . . or else the universe might be older than 13.8 billion years. . . or else the universe might be older than 13.8 billion years. And the evidence for that is..................................? But since this galaxy is receding from Earth at an estimated rate of 285,803 km/s (the speed of light is 299,792 km/s), the present (co-moving) distance to this galaxy is estimated to be around 26 billion light-years (7961 Mpc)." The influx of hotter matter accelerates the rotation of an object (the influx of stars to the cyclone in the center of a galaxy; related to stars, objects heat up by passing through the atmosphere and photosphere of a star  ). It is known that hot and fast-rotating stars are mostly found in nebulae or other matter-enriched space. Recent appearances of the objects from the outside of our system, A / 2017 U1  (1I / 2017 U1)  (inclination 122.69°) and C/2012 S1  (inclination 62,4°) confirm that such events are no rarity even in the space, which is less matter-enriched."